If you don’t notice the tiny deer tick bite on your body, it can be easy to dismiss signs of Lyme disease. You may suspect flu and give it a week or so, thinking it will resolve on its own. But by then, the bacterial infection has had time to spread. These types of symptoms might warrant someone considering getting medical attention, but not necessarily right away, he says. How does Lyme disease work? The bacterium Borrelia burgdorferi causes Lyme disease when it get into your bloodstream. You may experience a variety of symptoms, depending on the stage of infection. 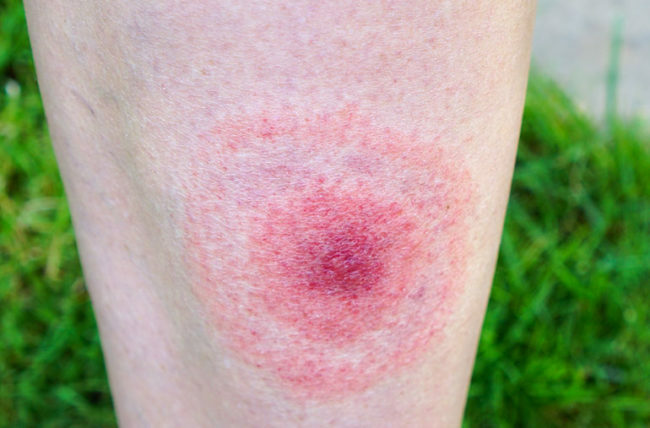 Early on, typical symptoms of Lyme disease include fever, chills, headache, joint aches and – most distinctively – a spreading rash that resembles a bulls-eye. But if it isn’t identified and treated within 36 to 48 hours, the infection can spread to other parts of your body, including the heart and nervous system. The later, more serious stages of Lyme disease can lead to neurological damage and arthritis. Most people notice the bulls-eye rash and seek treatment immediately. And, most often, that’s the end of the story, Dr. Sullivan says. Whether your doctor identifies the disease in early stages or late, the first step is to treat the infection with antibiotics. “In most cases, where it is more distant and has spread, once the infection is treated, the inflammation and the irritation to the nerves, heart and joints will slowly resolve over time,” Dr. Sullivan explains. Patients often ask whether a longer course of antibiotics would help speed healing, he notes. “Most patients are on antibiotics from 10 days to two weeks — if it affected the heart or spinal fluid, it’s four weeks,” he says. Eat a healthy diet and limit your sugar intake. Exercise at least three times a week for at least 30 minutes each day. Use anti-inflammatory medication when necessary. Is Earlier Better for Your Mechanical Heart Pumps?